View bold wedding dresses featuring sparkling crystal elements and elegant details. 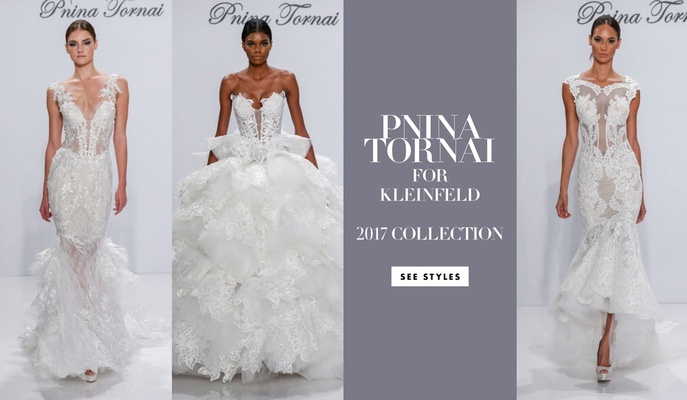 View more wedding dresses form the Dimensions 2017 collection by Pnina Tornai for Kleinfeld! Fully beaded netting dress with Swarovski crystals and beaded appliqués by Pnina Tornai for Kleinfeld. Fit-and-flare tulle and sequin gown embellished with transparent Swarovski crystals by Pnina Tornai for Kleinfeld. Drop waist, fit-and-flare gown with lace top, tulle skirt, and fully beaded belt embroidered with Swarovski crystals by Pnina Tornai for Kleinfeld. Fitted crepe georgette dress with transparent arabesque embroideries and an illusion back by Pnina Tornai for Kleinfeld. Fitted crepe georgette gown with a beaded corset and illusion cutouts by Pnina Tornai for Kleinfeld. Strapless beaded illusion sheath with lace-up corset by Pnina Tornai for Kleinfeld. Strapless fully beaded illusion bodice with basque waist and silk tulle ball gown skirt by Pnina Tornai for Kleinfeld. Full mermaid lace dress with illusion cutouts and low back by Pnina Tornai for Kleinfeld. Fit-and-flare Chantilly lace gown embellished with hand-beaded Swarovski crystals and embroidery with three-dimensional flowers by Pnina Tornai for Kleinfeld. Lace embroidered mermaid gown embellished with transparent crystals and long dramatic train by Pnina Tornai for Kleinfeld. Organza high-low ball gown with illusion back and skirt embroidered with floral corded lace by Pnina Tornai for Kleinfeld. Fitted crepe georgette dress with an embellished illusion back and arabesque-style appliqués by Pnina Tornai for Kleinfeld. Fitted beaded gown with sequin-embellished embroideries and illusion side panels by Pnina Tornai for Kleinfeld. Fit-and-flare silk organza dress with Swarovski embellishments, beaded lace appliqués, and Swarovski jewels at neck and back by Pnina Tornai for Kleinfeld. Long-sleeved Chantilly lace corseted ball gown with lace Guipure appliqués and transparent sequins by Pnina Tornai for Kleinfeld. 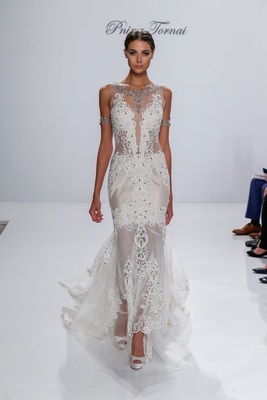 Mermaid lace gown embroidered with pearls and transparent Swarovski crystals by Pnina Tornai for Kleinfeld. Full dropped-waist corded lace and tulle ball gown with keyhole back by Pnina Tornai for Kleinfeld. Fit-and-flare corseted lace dress with illusion back and Swarovski crystal beaded straps by Pnina Tornai for Kleinfeld. Mermaid gown with layered silk organza and Swarovski-and-pearl beaded lace skirt by Pnina Tornai for Kleinfeld. Full mermaid gown with laser-cut flowers and ruffled skirt by Pnina Tornai for Kleinfeld. Full mermaid gown with a ruched bodice and tulle skirt with hand-rolled beaded tulle flowers embellished with Swarovski crystals by Pnina Tornai for Kleinfeld. 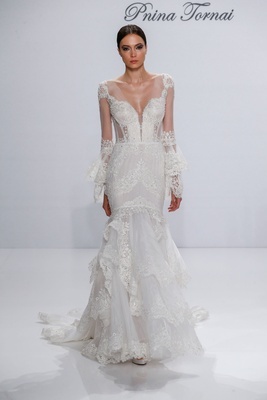 Laser-cut ball gown with dimensional layered ruffles by Pnina Tornai for Kleinfeld. Corset gown with fitted skirt and transparent crystals with butterfly wing lace appliqués by Pnina Tornai for Kleinfeld. Fit-and-flare embroidered net gown with lace insert by Pnina Tornai for Kleinfeld. Mermaid gown with ruched tulle and ruffle skirt with sequin-beaded flowers by Pnina Tornai for Kleinfeld. The finale gown of the Dimensions collection was a Chantilly lace ball gown with Swarovski crystal baguette embellishments and handmade flowers with layered tulle skirt and beaded train by Pnina Tornai for Kleinfeld. After debuting her collection in New York over 10 years ago, Pnina Tornai realized that every bride has the same wish: to be her most beautiful self on the day she commits to her beloved. The Pnina Tornai for Kleinfeld 2017 Dimensions collection epitomizes this belief, as it showcases a wide range of styles ideal for a number of bridal tastes. "'Dimensions' highlights my understanding that there is no limit to beauty and that there is a bride for every silhouette and style of gown," says Pnina. The gorgeous gowns in the 2017 collection feature striking elements, including plunging V-neck bodices embellished with crystals, gorgeous long trains and textured skirts, and elegant beading and embroidery. The dresses are made of the finest fabrics gathered from around the world, including unique laces, duchesse satin, crepe georgette, organza, and stretch silks and satins. Perfect for more daring brides, many of the dresses feature dramatic low backs, stunning mermaid silhouettes, and ravishing ball gown skirts adorned with hand-crafted embellishments. 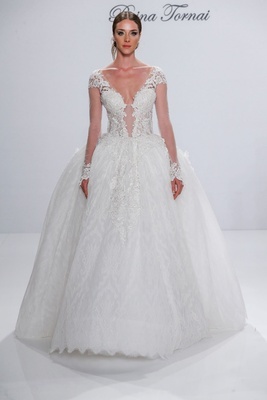 Take a look at the dresses in Pnina Tornai's 2017 bridal collection in the slideshow above!